In a July 2016 post I recommended a 500 EC (electroconductivity) salinity standard from July-to-mid-August for the western Delta. The longstanding Water Rights Decision 1641 standard includes this only in Wet years. It should apply in all year types unless south Delta exports are at minimum levels. In summer 2018, a Below Normal, subnormal snowmelt year, Jersey Point salinity was kept near 500 EC through early August (Figure 1) instead of the allowed 740 EC. Was this an adaptive management experiment? If so what benefits were derived from the experiment? Figure 1. 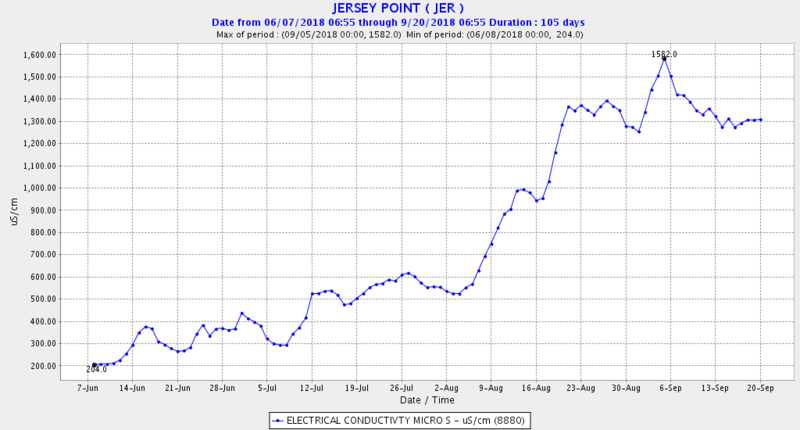 Jersey Point salinity (EC) remained near 500 EC in early summer 2018. The applicable standard was 740 EC 14-day average through August 15. The water temperature in the west Delta in 2018 was kept near 73°F or below (Figure 2), a good thing. In 2016, the previous Below Normal year, EC was allowed above 500 EC (Figure 3) per the existing standard. Water temperature exceeded 73°F to near 75°F (Figure 4), a bad thing, when EC exceeded 500. The reason for the higher early summer 2016 EC and warmer water temperatures was low Delta outflow (Figure 5). Outflow in 2016 was about 7000 cfs, but needed to be near 8000-9000 cfs. In 2018, outflow in late June was 7500-7900 cfs (Figure 6), in part due to relatively low early summer Delta exports (Figure 7) compared with 2016 (Figure 8). It is really too bad that we can no longer look to Delta smelt for response to adaptive management. But I suspect positive response to the 2018 “experiment” occurred in survival of other juvenile Delta fish (e.g., striped bass), shrimp, zooplankton, and phytoplankton. When 2018 data become available, the comparison with 2016 and prior years can be made. 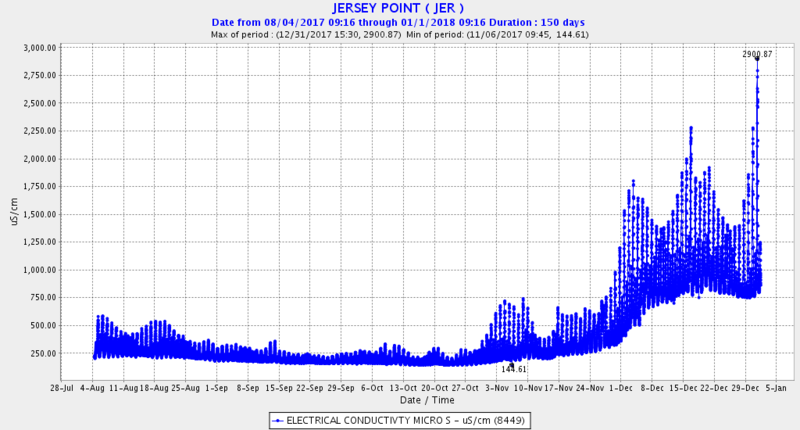 The salinity standard for the west Delta at Jersey Point and Emmaton should be 500 EC daily average unless south Delta exports are restricted to minimum health and safety levels. The standard should be year-round in all year types. Delta exports should be restricted to the minimum unless the salinity standard is met. Figure 2. 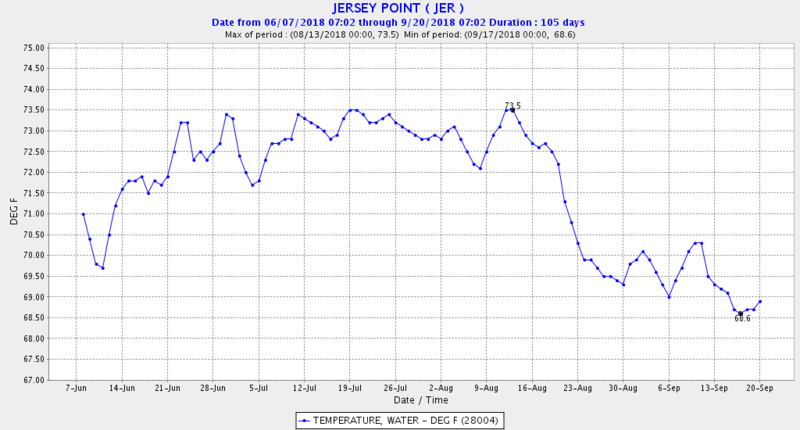 Water temperature at Jersey Point in west Delta summer 2018. Figure 3. 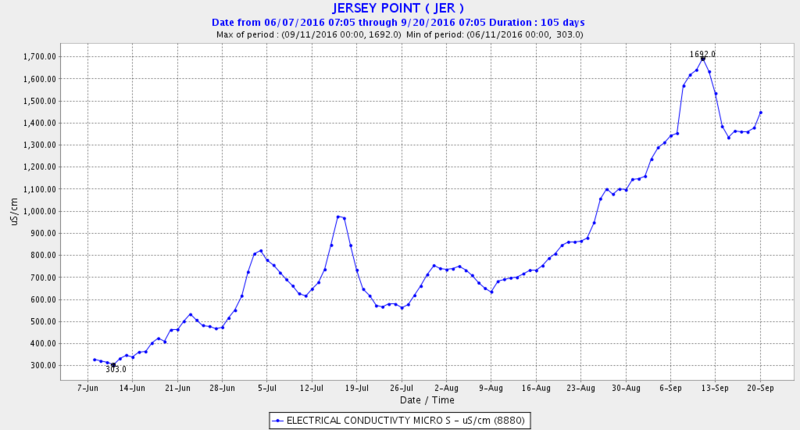 Jersey Point salinity EC summer 2016. Standard was 740 EC 14-day average through August 15. Figure 4. 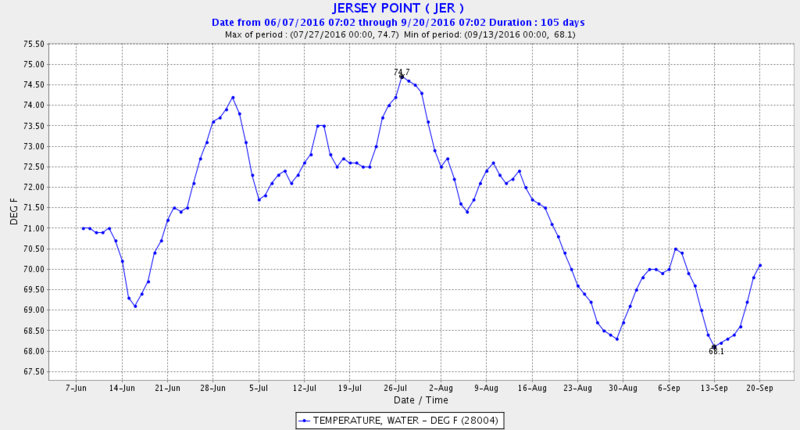 Water temperature at Jersey Point in west Delta summer 2016. Figure 5. 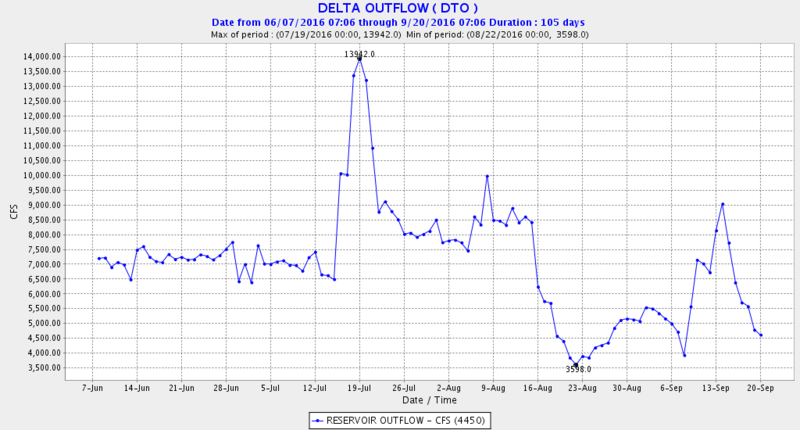 Delta outflow in summer 2016. Figure 6. 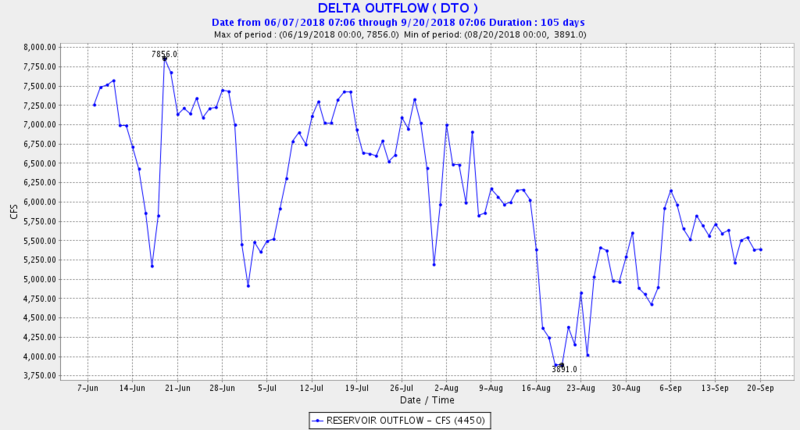 Delta outflow in summer 2018. Figure 7. State exports from south Delta summer 2018. Figure 8. State exports from south Delta summer 2016. It is well known that juvenile winter-run salmon migrate downstream to the Delta from their upper Sacramento River rearing area near Redding/Red Bluff with the first fall-winter flow pulses.1 Protection of this critical migration of winter-run has been recommended in recent Delta proceedings. In the WaterFix petitions process at the State Water Resources Control Board, such protection is referred to as “pulse protection.” So based on the importance of protecting winter-run during this key life-history stage, one would think such protection would have been applied in the fall of our most recent wet year 2017 and below-normal 2018. A quick check of the facts indicates otherwise. In 2017, the initial pulse of juvenile winter-run salmon passed Red Bluff (rivermile 240) during September and October, prior to any flow pulses (Figure 1). The first major pulses of flow occurred in the latter half of November 2017. A migration spike of winter-run-sized smolts at Knights Landing screw traps (rivermile 90) did occur during the flow pulse (Figures 1 and 2). Instead of protecting these winter run as they were entering the Delta, south Delta exports were increased to take advantage of the available inflow (Figure 3). The increase occurred with the Delta Cross Channel partially open (Figure 4), increasing the risks of migrating salmon to south Delta exports. Other than a four-day pulse, Delta outflow generally declined before and after the flow pulse (Figure 5). Salinity in the lower Sacramento and San Joaquin Delta channel generally increased with the higher exports and lower outflows (Figures 6 and 7). 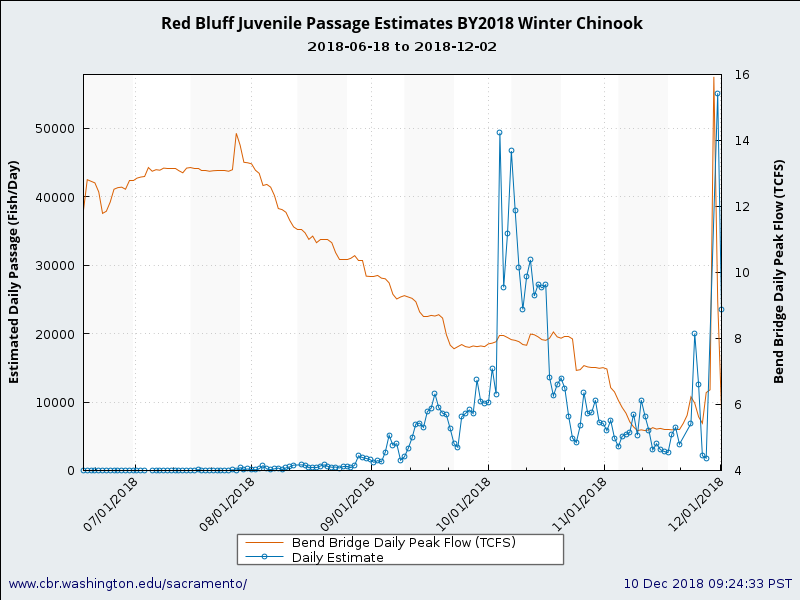 In 2018, the initial pulse of juvenile winter-run passed Red Bluff in September and October prior to flow pulses (Figure 7). The first major pulse of flow occurred at the end of November. 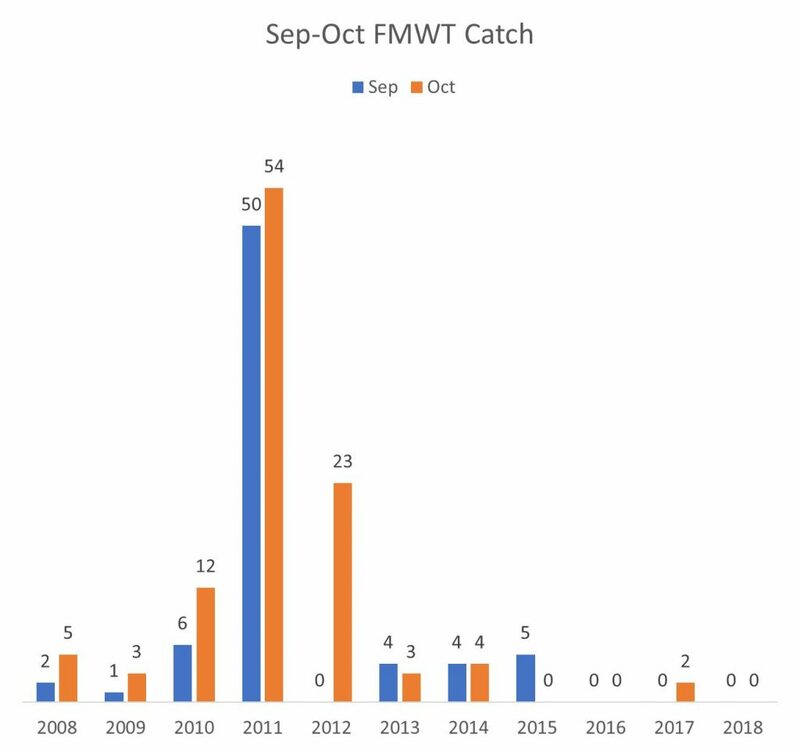 A migration spike of winter-run-sized smolts at Knights Landing screw traps occurred during this flow pulse (Figures 7 and 8). Instead of protecting these juvenile winter run as they were entering the Delta, south Delta exports were increased to take advantage of the available inflow, with nearly two-thirds of the Delta inflow being exported (Figure 9). The lack of protection is likely a consequence of the young salmon not showing up in salvage (Figure 2). For me, the high risk factors are clear. The lack of salvage simply indicates that few of the migrating salmon survive upon entering the Delta under high exports. High late-November and early-December south Delta exports are a high risk to the juvenile winter-run survival. Traditional high December exports of up to 65% of Delta inflow allowed under D1641 water quality standards are a major risk factor for winter-run salmon that must be changed. Declining flows below Keswick Dam (rivermile 300) during the fall, combined with the lack of flow pulses, are also a real concern. 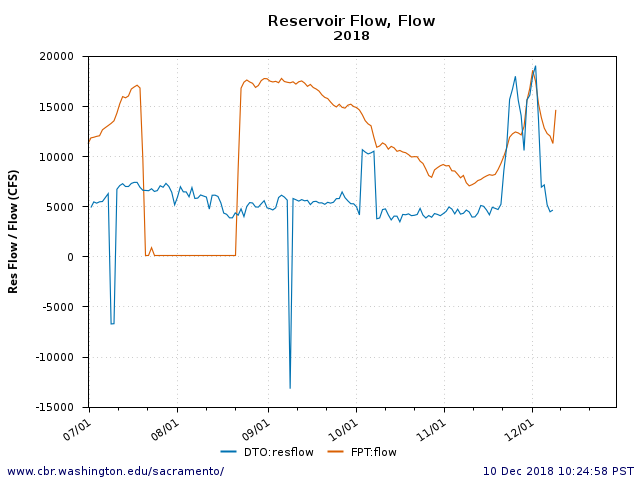 Juvenile salmon that pass Red Bluff (river mile 240) in September and October are sustained in low flow conditions for nearly 200 miles of modified river channel until the first rains in late November or early December. And the spawning reach directly downstream of Keswick gets no added flow even when it rains, because inflows to Shasta Reservoir are all captured. Figure 1. Juvenile winter-run salmon estimated passage and stream flow at Red Bluff (rivermile 240) from late summer 2017 to June 2018. Figure 2. 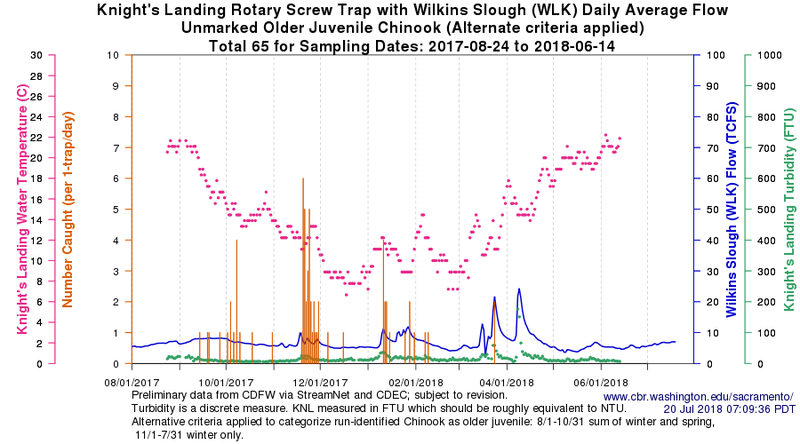 Lower Sacramento River screw trap collections at Knights Landing (rm 90) since August 2017 along with flow, turbidity, and water temperature. Note late November catch event during flow pulse. Figure 3. South Delta exports in fall 2017. Note peak exports mid-November through early December – total 10,000-11,000 cfs (22,000 acre-ft per day). Chinook salvage is shown as zero. Figure 4. 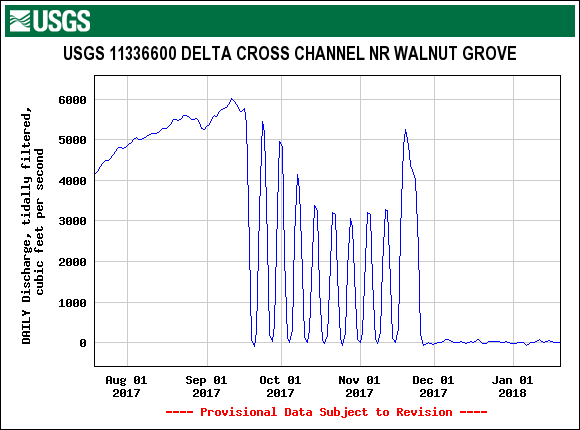 Flow through Delta Cross Channel August through December 2017. Note sporadic opening late September through November 2017, and closure at end of November. Figure 5. 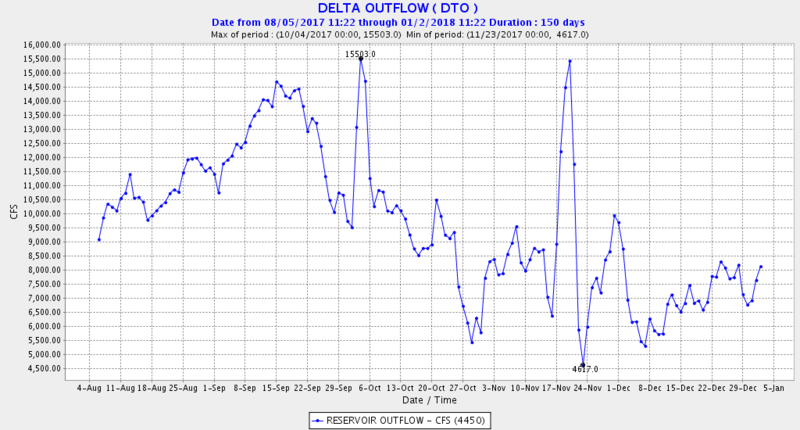 Delta outflow August through December 2017. Figure 6. 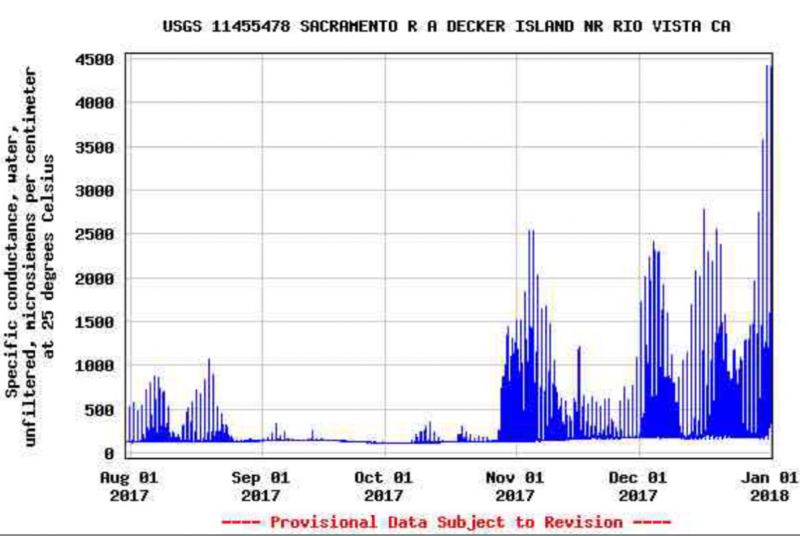 Salinity (EC) near Rio Vista on lower Sacramento River channel in the Delta, August through December 2017. Figure 7. Salinity (EC) near Jersey Pt on lower San Joaquin River channel in the Delta, August through December 2017. Figure 8. 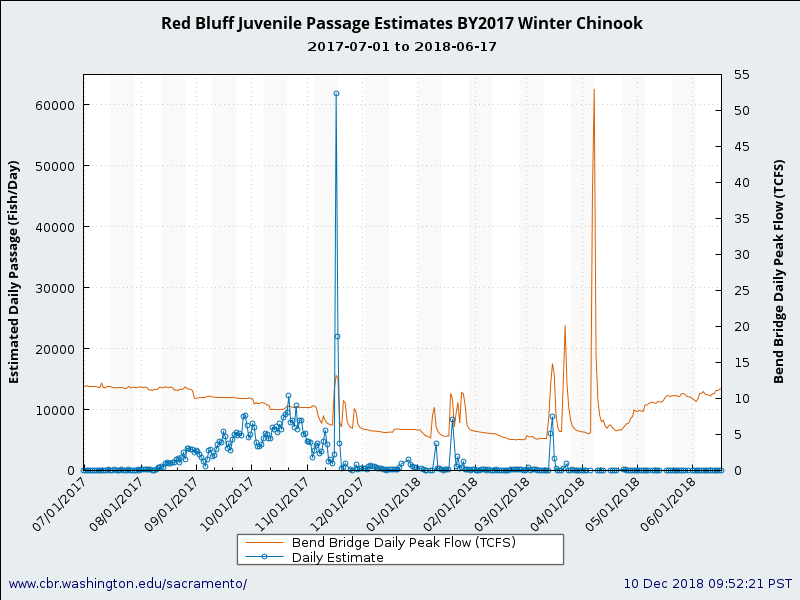 Juvenile winter-run salmon estimated passage and stream flow at Red Bluff (rm 240) from late summer 2017 to June 2018. Figure 9. 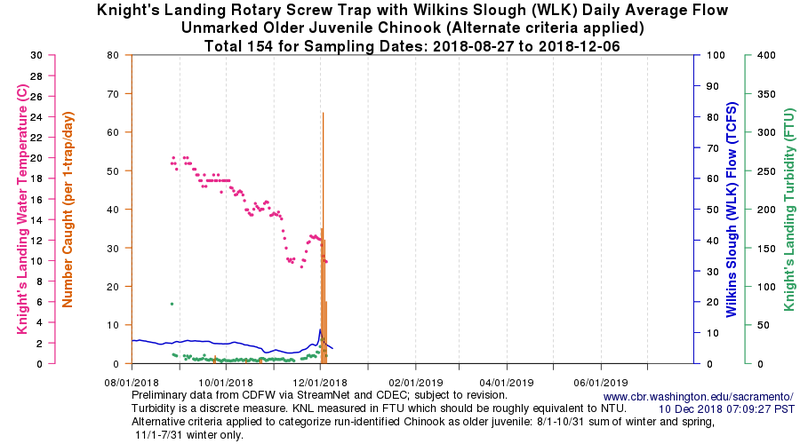 Juvenile winter-run salmon estimated passage at Knights Landing (rivermile 90) and stream flow at Wilkins Slough (rivermile 125) from late summer to fall 2018. Note early December pulse of fish, flow, and turbidity. Figure 10. 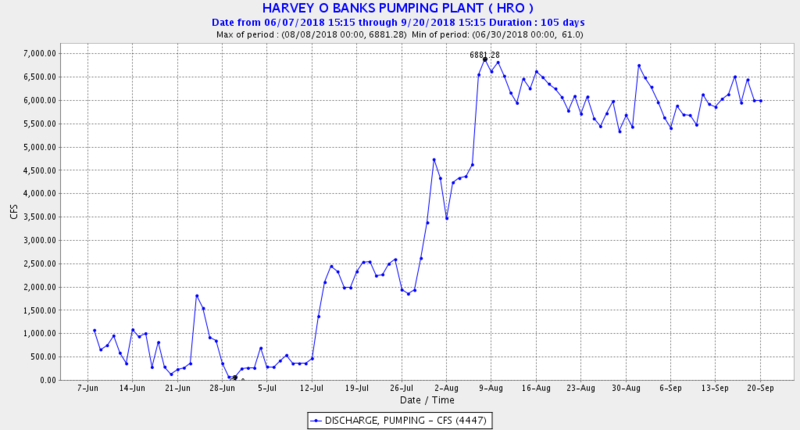 Export rates from two south Delta pumping plants (Tracy TRP and Banks HRO) summer and fall 2018. Figure 11. 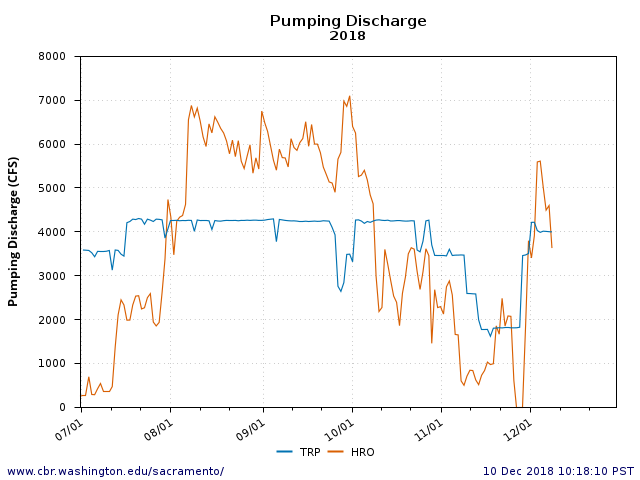 Lower Sacramento River flow at Freeport (FPT, rm 55) and Delta outflow (DTO) summer and fall 2018. Though I hate to “beat a dead horse” or perhaps more appropriately “put another nail in the coffin,” I’m sad to report that the California Department of Fish and Wildlife’s first two fall trawl surveys for 2018 collected no Delta Smelt. This is consistent with this past summer’s townet survey results. Let’s get on with implementing the smelt hatchery program. A recent science paper reminded me about the benefits of aquatic vegetation to lake fish species like largemouth bass. It also reminded me that invasive aquatic vegetation has ruined lake-like salmon habitats of the west coast, such as Seattle’s Lake Washington and portions of the Columbia River and California’s Bay-Delta estuaries. Instead of rearing salmon and smelt, these waters now rear non-native bass and sunfish (centrarchids). These once-turbid waters conducive to rearing juvenile salmon and smelt are now best suited for sight-feeding centrarchids, competitors and predators of salmon that love clear water and abundant cover. The non-native aquatic vegetation (Egeria, hyacinth, and milfoils) in the Bay-Delta provides abundant cover, uses all the aquatic plant nutrients, and collects the suspended sediment – all bad for the Bay-Delta’s pelagic/planktonic habitat. Other than gripe about the obvious problem over the past several decades, what has anyone done about it? Boating and Waterways has tried spraying herbicides, but that has been costly, ineffective, messy, and organically/chemically polluting. 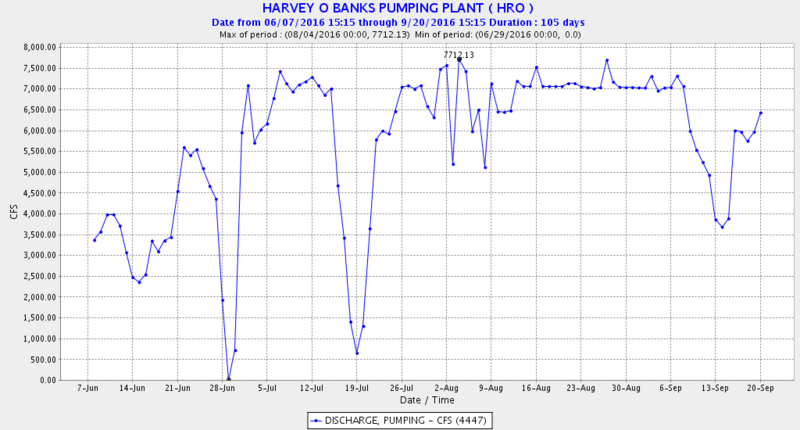 Flushing the Delta all year with more-and-more clear reservoir water to south-Delta export pumps has not helped. The proliferation of non-native clams has also contributed to the problem. There are no easy solutions, but there are options that should be implemented. Though costly and with their own environmental problems, these options can potentially lead toward recovery of the most important Delta habitats. The best option is an aggressive (and expensive) long-term program of manual cutting and harvesting using boat‐mounted cutters, harvesting barges, and suction dredges to remove the rooted and floating aquatic plants. A longer-term option is to increase turbidity from inorganic and organic sources by adding silts or reducing silt “sinks;” this would help cut sunlight and nutrients to rooted aquatic plants. Direct application of aquatic fertilizers has recently been considered by resource agencies; this could also help. Finally, reducing exports from the south Delta could help because it would reduce the proportion of low-turbidity reservoir water in the Delta and lessen the direct loss of millions of tons of silt. Shifting the Bay-Delta habitat away from centrarchids by increasing Delta turbidity will measurably improve salmon and smelt recovery.